Bitcoin dives after the PBOC, China’s central bank, said ICO (initial coin offerings) are illegal and asked that all related fundraising activity to be halted immediately, issuing the strongest regulatory challenge so far to the burgeoning market for digital token sales. Monday,the PBOC on its website announced that it had completed investigations into ICO’s (initial coin offerings), and will strictly punish offerings in the future while penalizing legal violations in ones already completed. The regulator said that those who have already raised money must give refunds, though it did not specify how the money would be paid back to token investors. It also said digital token financing and trading platforms are prohibited from doing conversions of coins with paper (fiat) currencies. Digital tokens cannot be used as currency on the market and banks are forbidden from offering services to ICO’s. This is in step with, thought not to the same extent, what starting to see in other jurisdictions, the story is that regulations are coming and China, due to its size and as one of the most speculative IPO markets has taken firm action. Bitcoin tumbled as much as 11.4%, the most since July, to 4,326.75. The ethereum cryptocurrency was down more than 16% Monday, according to data from Coindesk. 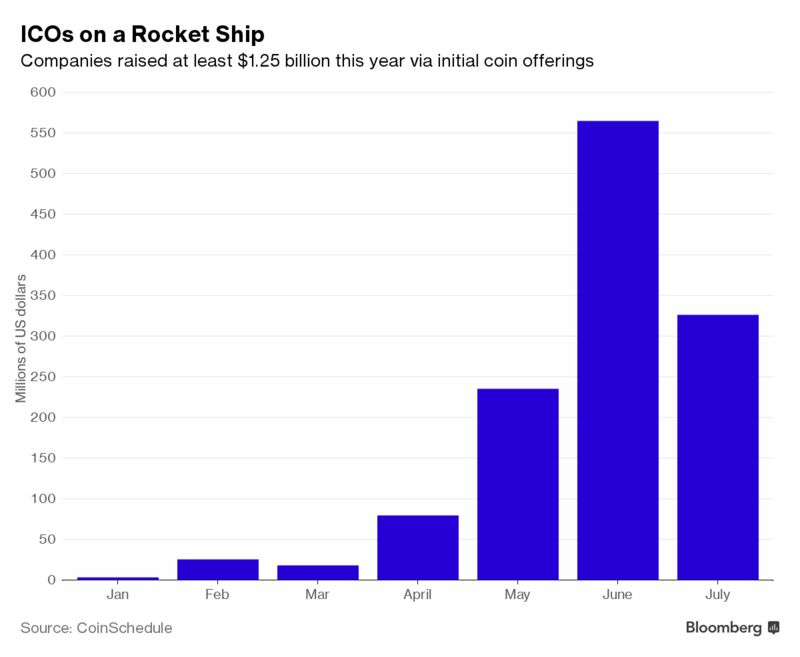 ICOs are digital token sales that have seen unchecked growth over the past year, raising $1.6-B. And they have been deemed a threat to China’s financial market stability as authorities struggle to tame financing channels that sprawl beyond the traditional banking system. Widely seen as a way to sidestep VC (venture capital) funds and investment banks, they have also increasingly captured the attention of central banks that see in the fledgling trend a threat to their reign. The PBOC’s directive made no mention of cryptocurrencies by name such as Ether or Bitcoin. According to a report by the National Committee of Experts on the Internet Financial Security Technology here were 43 ICO platforms in China as of 18 July, and 65 ICO projects had been completed, the committee said, raising $398-M that is $398-M that the PBOC says must be returned. An ICO is a cross between crowdfunding and an and IPO (initial public offering), ICO’s involve the sale of virtual coins mostly based on the ethereum blockchain, similar to the technology that underpins Bitcoin. But unlike a traditional IPO in which buyers get shares, getting behind a startup’s ICO nets virtual tokens, unique to the issuing company or its network. Meaning they grow in value only if the startup’s business or network proves viable, attracting more people and boosting liquidity. That is the Big If, and the profusion of untested concepts has spurred talk of a bubble. The US Securities and Exchange Commission (SEC) signaled greater scrutiny of the sector when it warned that ICO’s may be considered securities, however, the SEC stopped short of suggesting a broader clampdown. The US regulator reaffirmed its focus on protecting investors, and said issuers must register the deals with the government unless they have a valid excuse. The huge amount of money amassed in a short period of time has attracted cyber criminals, with an estimated 10% of money intended for ICOs looted away by scams such as phishing this year, according to Chainalysis, a New York-based firm that analyzes transactions and provides anti-money laundering software. Personally, I have heard of some gut wrenching theft stories happening in this sector. Just today we learned that in a Tweet, that Paris Hilton said she was “looking forward to participating” in an ICO run by LydianCoin Pte Ltd, which describes itself as a “utility-token that allows cryptocurrency-enabled purchasing of targeted, AI driven digital marketing and advertising services” to be operated and developed by Gravity4 Inc., an online advertising company. Ms. Hilton is not the 1st celebrity to endorse an ICO. Boxing champion Floyd Mayweather and American rapper The Game have extolled the diverse digital token sales over the past month .